I just got this awesome pocket disc and it is so much fun!! This is a great take on a traditional frisbee. 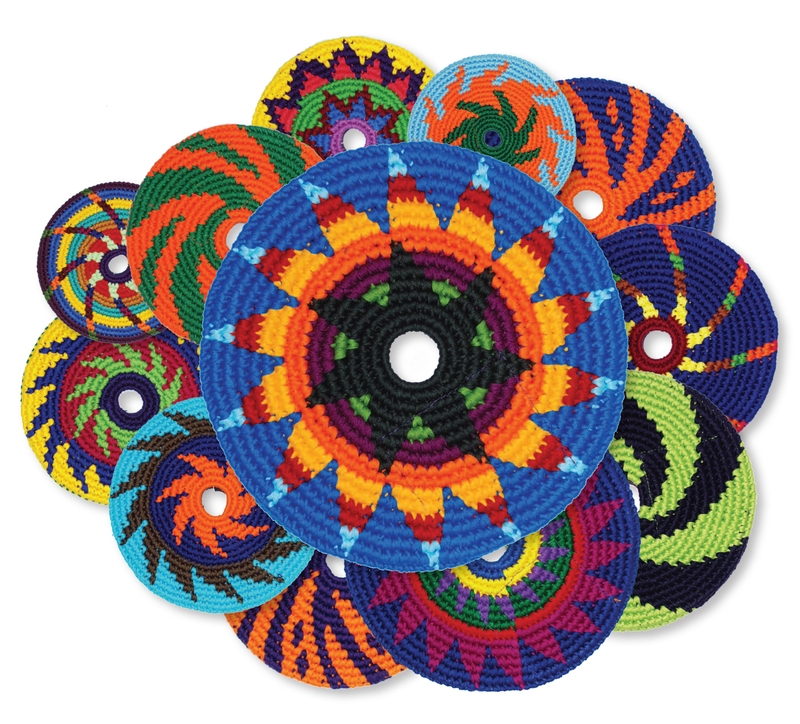 You get a hand-made crocheted circular disc that is made of beautiful yarns. The design we got was so intricate and interesting. You can use these like a traditional frisbee and throw it back and forth to each other, we have four dogs so we use ours with our dogs all the time, they love it. My favorite feature is that it’s made of yarn so it’s soft and flexible and easy to handle and use. You don’t have to worry about it hurting the dogs when they catch it with their teeth because it’s not hard plastic it’s a soft flexible material that they can easily chew, bend, etc. My six year old loves playing with this because it’s easy to catch and throw. It’s a great twist an a traditional item. The Pocket Disc is the most versatile disc on earth. All cotton and very packable, its the ultimate travel toy – people love playing anwhere from music festivals to indoors with their kids on a rainy day. Dogs love ’em too b/c they won’t chip their teeth or cut their gums. As a play toy (not left out to chew), the Pocket Disc will last for years for fido. The unusual origins of the owner’s daughter’s school project evolving into a Fair Trade flying piece of art hand crocheted by Mayan villagers in Guatemala is a touching story. Six years later and over 1 million discs sold, we now help support over 500 artisans. We have installed water filtration systems in their villages and the work is enabling the children to stay in school longer, enhancing their education. But most of all the Pocket Disc is fun. They come in a wide range of beautiful ethnic patterns as well as team color combos and have a wide range of peculiar and practical uses (see website) and games. While simple, the Pocket Disc inspires creative play and a divesity of games spring forth from the end users minds. We also offer a nice array of support items including 4 styles of Pocket Discs, kicksacks (aka hacky sacks), pet collars, headbands, and more. You can find out more and purchase on their Website!